Pine Box is reaching out to Studio 2 regarding use of previous organized play kits in an effort to provide them to distributors and retailers that stock Doomtown products. We will keep you folks updated moving forward on this goal. 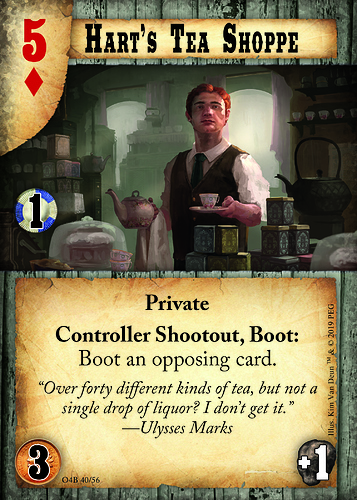 Moving towards the next expansion, 'Out For Blood,' we present a new spoiler, in tribute of the tea@Hart game store in Hartletpool. Peter Hart graciously supplied us with a Doomtown cake during the 2018 World Championship and has been a supporter of Doomtown throughout Pine Box's continuation of the organized play series. Thank you so much and we hope you enjoy the card! Please let us know below if you have any questions regarding distribution and retail that we can address!